Let's get started and create a Sampler Quilt! If you are a beginner quilter these quilting lessons and links will take you through all the necessary steps to create a beautiful sampler quilt. A sampler is made up of several different blocks. 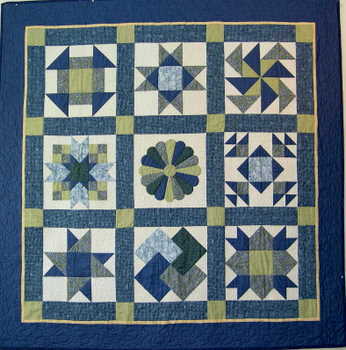 By making a variety of blocks, you learn different quilting techniques. These quilting lesson basics will not only make it easier to assemble your project (and thus minimize the frustration level!! ), it will also assist you in following other patterns and instructions for future endeavors. I love blue and green together, and that's why I chose those colours for a sampler using my favorite blocks. The light background provides a lovely contrast, allowing the colours to sparkle. See the instructions following to make each block. The following quilting lesson walks you through each of the important steps to create and finish your quilt. Please make sure you review the Basic Tools and Fabric Requirements before going to Quilting Lesson 1. Need fabric? Have you checked out the great prices at Fabric? There is always a SALE on!!! Ok, are you ready to cut and piece??? We are not quilting yet, just piecing. Quilting is the stitching through all three layers of your quilt (top, batting, and backing) so first we need to piece the top. Then we can layer the quilt top, the batting, and quilt backing, and get on with the actual quilting. When the quilting is done, we will put a binding all around the edge of the quilt to finish the edges, and stitch a label on the back so that future generations know who made this wonderful quilt. There are lots of good books that you can purchase. One I especially like is the Quilters Complete Guide by Fons & Porter. It is full of very helpful information, and is written in a way that is easily understood. I find all of their books to be fabulous! To read customer reviews click the logo. Ready to start your quilting lesson? Basic Tools and Fabric Requirements lets you know what you need to get started. I explain how to create easy blocks. Click the links below to find out how to make nine popular blocks. The Card Trick quilt block and Judy's Star quilt block are always a favorite with beginners. The following are all 12" blocks. This means that when you have finished the block it will measure 12 1/2" because it has 1/4" seam allowance all around it. After it is sewn into your quilt, it will measure 12". If you have a 1/4" foot for your sewing machine, now is the time to put that on. Most quilt patterns tell you to cut a strip across the width of the fabric (WOF). This means that you have your fabric folded in half with the selvedges together just as it came off the bolt, and you are cutting two layers at right angles to the selvedges. I explain how to sew blocks together with sashing and cornerstones. This will help keep your quilt square, making you happier with your finished product. you get the low down on borders. In other words, how to sew them on and keep them square. is all about choosing the backing and piecing it to make it large enough. I show you how to baste and prepare for quilting. Learn basic basting techniques and tips on getting it done the easy way. you learn how to quilt by hand or with a sewing machine. you learn how to label your creations and why it is so important. are you going to hang your quilt on the wall? Put a sleeve on the back to make hanging it a snap! Remember if you have questions or are a bit confused on any of these quilting lessons please contact me and I will get back to you with answers. Finished with Quilting Lessons? Return "Quilting Homepage"